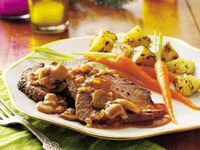 Drape a rich mushroom sauce over slices of perfectly seasoned beef tenderloin for a memorable holiday dinner. Heat oven to 425 degrees F. Rub beef with oil; sprinkle with pepper. Place beef on rack in shallow roasting pan, or place diagonally in 15x10x1-inch pan. Insert ovenproof meat thermometer so tip is in center of thickest part of beef. Meanwhile, in 12-inch nonstick skillet, melt butter over medium heat. Cook onion, garlic and mushrooms in butter 8 to 10 minutes, stirring occasionally, until mushrooms are completely tender and beginning to brown. Stir in sherry. In small bowl, mix cornstarch and water; stir cornstarch mixture into mushroom mixture. Stir in thyme, pepper and beef consomme; cook and stir about 2 minutes or until slightly thickened and bubbly. Stir in mustard and tomato paste until well blended. Heat just until hot. Spoon sauce over sliced beef. High Altitude (3500-6500 ft): In step 3, increase second cook time to 4 minutes. Calories 270 (Calories from Fat 140); Total Fat 15g (Saturated Fat 6g, Trans Fat 1/2g); Cholesterol 85mg; Sodium 240mg; Total Carbohydrate 3g (Dietary Fiber 0g, Sugars 0g); Protein 30g. Daily Values: Vitamin A 6%; Vitamin C 0%; Calcium 0%; Iron 15%. Exchanges: 0 Starch; 0 Other Carbohydrate; 0 Vegetable; 4 1/2 Lean Meat; 1/2 Fat. Carbohydrate Choices: 0. This entry was posted on 2:57 AM and is filed under Beef . You can follow any responses to this entry through the RSS 2.0 feed. You can leave a response, or trackback from your own site.